Great Leadership: A New Career Opportunity! If you’re wondering why I haven’t been posting very frequently lately, I’ve been a little distracted. A couple weeks ago I started a new job. On 2/14, I became the new Director of Executive Development Programs at the University of New Hampshire's Whittemore School of Business and Economics (WSBE). Here's a link to the press release. With our two daughters in college, this opportunity allows my wife and me a chance to pursue our goal of moving to the seacoast area of New England. UNH is located in Durham, New Hampshire, about 30 minutes from the ocean and Portsmouth, NH, 60 minutes north of Boston, 60 minutes south of Portland, Maine, and about 30 minutes from the mountains. We’ve vacationed in this area for years, and it’s our favorite part of the world. We're in the process of selling our home in upstate NY, and looking for a new one in the Seacoast area. I'll be responsible for marketing and managing custom executive development programs. Basically, I'll be working with clients to determine their needs, and then collaborate with WSBE faculty and external partners to develop and deliver high-impact learning experiences. We can deliver programs at the client’s site, or at our partner conference facility in downtown Portsmouth, NH. My last position was Manager of Leadership & Management Development at Paychex, Inc, a $2 billion payroll and HR outsourcing company. As you can imagine, much of what I wrote about was based on my work at Paychex, as well as previous companies. For example, a recent post about “Passing the Leadership Baton” was written as I was working on my own transition. This new opportunity should now give me plenty of new blog material. I hope to have guest posts from some of our staff and professors and lot’s of new insights, learnings, and fresh leadership development advice. It will be an exciting new career transition for me.... a chance to keep doing what I love to do, while at the same time practice what I preach and branch out in some entirely new directions in order to learn and develop. 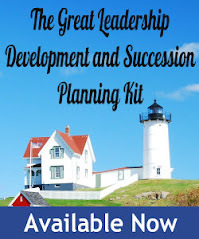 At some point, I'll probably even do a little succession planning and leadership development consulting on my own; maybe even finish that e-book I've been working on. I don't anticipate any major changes for Great Leadership. I'll still maintain ownership of it and post as often as I can. One small difference is I’ll now be public about where I work, although the opinions expressed will be my own and not UNH’s. I’m so jazzed about all of this, and am pleased to finally share it with all of my readers. 1. Where are the best restaurants in the seacoast area (you can see where my priorities are)? Who makes the best "chowda"? Best lobster roll? Best "woopie pies"? Can I still get an good order of chicken wings? 2. Do you have any tips for successfully transitioning from industry to academia? 3. How about from being a "buyer" to a "seller" of leadership development/training programs? 4. Tips on succeeding in a new job in general? 5. Do anyone have any contacts in the New England area? Potential clients, suppliers, partners, or other networking opportunities? Email me at Daniel dot mccarthy at unh dot edu or LinkedIn. 6. Is it hard to learn to surf? Or should I stick with boogie boarding? 7. Any home selling or buying advice? We've already buried the Saint Joseph statue. 8. Any tips for settling into a new community? 9. What's the most important thing you look for in a university-based executive development program, or any leadership/management development program? 10. Is it possible to remain a Buffalo Bills fan in the heart of Patriot's country? Should I remain loyal to a losing franchise, or jump ship? Thanks for your continued support, and I look forward to your advice and hearing from you! Congratulations, Dan! Wish you all the best in your role! Wish you the best at the new job! All the best to you in this new venture! Dan, your enthusiasm lights up your post! Isn't it cool that we can continue to stay in touch through the power of all of the social media we use. UNH is lucky to have you as the Director of Executive Development Programs. Congratulations and best wishes. Gosh I love it when a plan comes together! Congratulations! It's been decades since I lived in that part of the world, so I'll pass on the restaurant recommendations. From my corporate gypsy period, I offer the following. When you pick a place to live, pay attention to commute time, always thinking about the worst weather. Find connections quickly. For me that happened through church, gyms, and professional associations. New Hampshire is perhaps the best state in the Union in my humble opinion. You're going to love living there. Thanks, and yes, it's nice to be able to keep all of my virtual contacts no matter where I live or work. Thanks, and sounds like wise advice. Congratulations on your new role! It sounds like a great opportunity. I have been visiting your blog for awhile and this is my first time commenting. I have worked with universities in a variety of roles. The collection of smart, vocal, and independent thinkers in universities make them interesting places to work. There are also many intrinsic rewards in working with researchers and professors who are doing important work that positively impacts society. These dynamics raise some management and administration challenges also. Consensus is big and power is frequently distributed among various stakeholders. Major decisions often involve communication and agreement among various stakeholders. Much will depend on the type of university and its main focus (research, teaching, or public service) and how it is organized. Some schools in a university have much autonomy; in other universities there may be more central control. In general, allies are important. Also, administrative managers that support the enterprise should expect their views to be challenged at times. It is generally not personal; universities place high value on free thinking. Based on your work, you will be an asset for the university as you work to bring the corporate and academic worlds together in your program. I am sure this will be a great opportunity for students to pick your brain. I am also curious about how this new tenure will give you different dimension to your leadership and management abilities. I will look forward to see more blogs on your challenges. Wish you and your family the best. I transferred with Paychex to Salt Lake City 10 years ago. So I say YES - you can remain a Bills fan!! But I'm still looking for a good place to get wings. And the hardest transition.... there's no Wegmans! Best of luck to you and your family!!! Answer to question #6 - no, it's not hard to learn how to surf. With a good instructor, you'll be able to stand up and ride a wave during your first lesson. A little more difficult is learning how to choose waves on your own. I'm speaking from experience here - I learned how to surf last October because I thought that learning to swim needed to be tied to a goal (I started taking swim lessons last March). Good luck with the move and the new job! Love it that you are moving to New England. I've enjoyed your blog for a couple of years now. I work in HR at a non-profit in Boston and it is blogs like yours that have continued to push my HR thinking forward while working in a small and under-resourced department. As for food, THAT I can speak to... Red's Eats in Wiscasset, Maine consistently gets rated one of the best lobster rolls in Maine. It's a shack on the side of the road, it's fantastic. A little closer to Portland I would try Harraseeket Lunch and Lobster in South Freeport Maine... a little more picturesque, cute tiny town on a working harbor. Whoopie Pies are another thing altogether. First of all, you should spell them right, that will get you kicked right out of Maine in a heartbeat. And really, the best you'll find will be some no-name semi-homemade whoopies at a gas station somewhere. I kid you not, those will be the best! There are some commercial versions, Wicked Whoopies etc... my suggestion is make friends with a local and ask their grandmother to make them. If that doesn't work, I'll have mine send you some. Thanks! It's easy to see you've had considerable university experience. Very helpful, good advice! Good news on the wings and Bills, and yes, Wegmans will be missed. Thanks! Great advice, thanks. And yes, I love Art's stuff too! Great, that's encouragiong news on surfing! thanks. Can't wait for summer. First of all, thanks for the kind wods regarding my blog. That's exactly what keeps me motivated, with people like you in mind. Second, thanks for the foodie tips. Those are just the kind of joints we love! Asa for whoopie pies - tthere's actaully a proposal in state government to make them the offical food of Maine. The blueberry lobby is opposed. To all readers - this has been great! I love the comments, support, and advice! It means a LOT to me, thanks. Great news and congratulations Dan. I think you will love it. Best! E.
Congratulations Dan, I look forward to continuing to follow your Blog! It sounds like a great opportunity and I wish you the best. Congratulations on the move, Dan - sounds like an exciting opportunity, both personally and professionally. I have a daughter attending one of the other New Hampshire colleges (sorry!) - and have grown to love the state in my visits over the years. Look forward to hearing about your thoughts and experiences as you consider leadership from this new perspective! As a UNH alum, former WSBE student and New Hampsha native, welcome to the Northeast. A few people have weighed in on places to eat. I can't comment since it's been almost 20 years since I've visited NH long enough to eat at someplace other than my Mom's! The best whoopie pie's are always homemade or from a Church fair. And as long as you're pronouncing the food correctly, you'll be in good shape... Lobstah, chowdah, beeah. Best places to live? Depends on how much you can afford. Living close to campus will probably allow you to be more involved with the UNH community. Make sure you get to a few hockey games. Our men's and women's teams are top-notch. As far as WSBE's executive outreach... As good as WSBE may be, it's a hard sell to get past the noise of the top-tier MBA programs and online programs. I hope that you're able to show why WSBE is a good choice when matched against Hahvahd and Dahtmouth! Hey thanks, it's great to hear from a "Wizzbee" grad (I'm glad we're changing our name). Your are right, the regional compitition for exec ed is tough. The only way we can compete is through superior client service, hard work, and great custom programs that help solve real-world business issues. I think I have a network of externals providers that can complement our faculty that I can leverage to serve a client's needs in a cost-effective way.